Everyone knows that the MHC is in the MHC, right? Well, it’s not necessarily so. That’s not as tautological as it sounds. MHC (major histocompatibility complex) can refer to either the protein complex, or to the genomic region. In most species the genes encoding MHC proteins are clustered together into a distinct region of the genome that usually contains a bunch of genes that are functionally, and in some cases structurally, linked. For example, the human MHC genomic region contains not only many MHC class I genes, but also the TAP genes that are required for their function (outline of function here); MHC class II genes, and a number of genes required for their function; some proteasome subunits that are also involved in the antiviral MHC function; and so on. 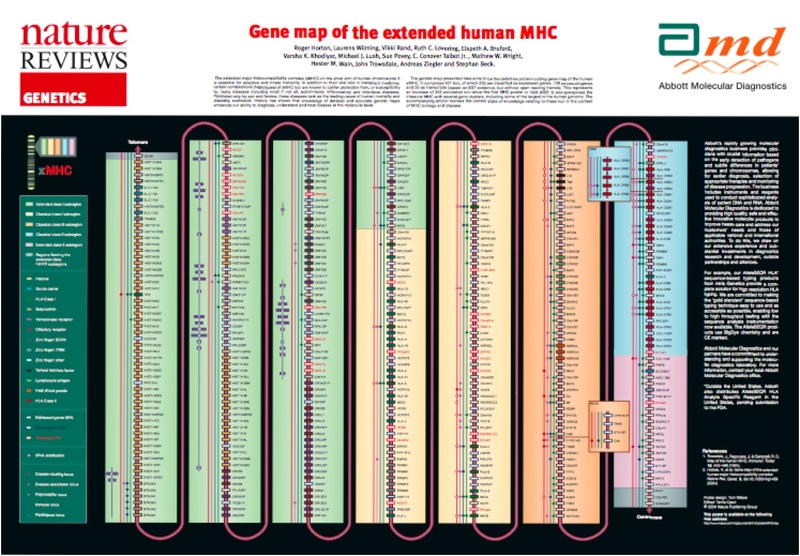 There’s a crude map here, and a somewhat more detailed one here; in humans and many other species the MHC genomic region is densely packed with genes, many of which are immunologically important. Although the details are different the same concept applies to many vertebrates — chickens 1, Xenopus (frogs),2 and sharks,3 for example, have only one classical MHC class I gene, but it’s recognizably in the MHC genomic region, tightly linked to TAP and not quite as tightly linked to MHC class II genes. Why are these functionally-related genes clustered together? There are probably a bunch of reasons, and the reasons may actually be different for different species. A recent paper,4 showing a partial exception to the rule, makes some interesting suggestions. Siddle et al5 have looked at wallaby MHC genes and find that their classical MHC class I genes are actually scattered throughout the genome, and are not in the MHC region. First of all, what’s the advantage of having a single MHC class I gene tightly linked to TAP (probably the primordial organization)? TAP transports peptides to the MHC (again, cartoons of MHC class I function here), and the MHC then presents the peptides to T cells for antiviral surveillance. That means that TAP needs to handle the same kinds6 of peptides that the MHC class I does. By linking the genes for TAP and the MHC class I, the two can evolve in tandem — if a particular MHC class I gene likes to bind peptides ending with, say, arginine, then it can co-evolve along with a TAP that likes to transport peptides ending in arg. MHC class I genes are extremely variable, and in non-mammalian species, TAP genes are also relatively variable, 7 arguing for this kind of co-evolution. The problem with this organization is that it only really allows one MHC class I specificity. If the TAP has a certain, strong, specificity (ending with Arg, say), and you had several different MHC class I proteins each with different peptide preferences (one that wants peptides ending with Arg, but another that wants peptides ending in tyrosine), then some of them wouldn’t match the TAP peptides and would go wanting. Although it’s not a hundred percent clear why MHC class I is so diverse,9 according to the most plausible explanations the advantages of diversity are going to be increased if you have several different MHC class I genes, with different peptide-binding properties. If you can hoick the MHC away from TAP, then, you’d allow the MHC to start diversifying independent of TAP. You’d probably need TAP to now be fairly peptide-promiscuous (which it is, in most mammals), and shift the peptide specificity over to the MHC class I molecules themselves. Humans, mice, and most mammals that have been looked at do this (separate MHC class I from TAP, and have multiple MHC class I alleles) by sliding the MHC class I genes over to the side, remaining within the MHC genomic region but becoming far enough separated from TAP that the genes can evolve more or less independently. Wallabies apparently have done the same thing functionally, but instead of sliding over and keeping the genes in the MHC genomic region, they’re scattered throughout the rest of the genome, apparently via retrotranspon-mediated transposition. Incidentally, it occurs to me that there is an extra cost to this increased diversity. By un-linking TAP specificity from MHC class I peptide preferences, mammals force TAP to be highly promiscuous, and to transport a wide range of peptides — unlike in chickens, TAP no longer “knows” what MHC allele it’s dealing with and has to offer every possible peptide sequence that any of the thousands of MHC class I alleles could bind. 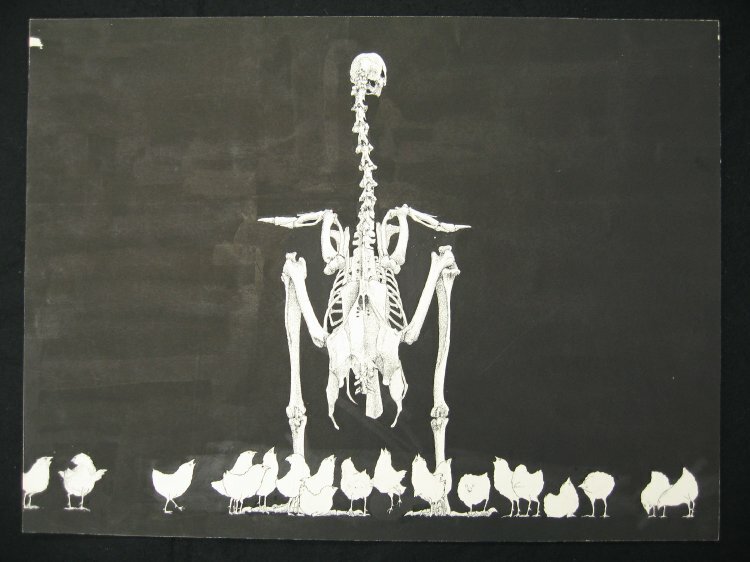 That means that there must be a vast amount of wasted peptides transported into the endoplasmic reticulum; in contrast, I would expect chickens, for example, to predominately only transport peptides that can bind to their MHC class I. If you suspect, as I do, that peptides are intrinsically toxic at high doses, then mammals must have developed (or enhanced) some mechanisms for destroying the extra peptides, that non-mammalian vertebrates don’t have to worry about. I have a guess as to what the mechanism might be, but I’m not sure exactly how to test it right now. Given how many T-cells and B-cells are deleted through establishment of central tolerance or through anergy, does it really surprise you that the TAP proteins of mammals favor volume over efficiency? I have a guess as to what the mechanism might be, but I’m not sure exactly how to test it right now. I too have a guess (more along the lines of mammalian ‘enhancement’ rather than ‘invention’). If my idea is the same as yours, I know at least one group trying to test it experimentally. We’re probably on the same page, and I can make a good guess at the group you’re thinking of. But non-mammalian T cells also get deleted; why would mammalian TAP need to be different? True, there should be TAP and MHC that don’t line up, but in contrast to the mammalian situation, (in theory) all of the peptides transported by the TAPs should find a binding partner in the appropriate MHC. By comparison, mammalian TAP must transport vast numbers of peptides, probbly >90% of them, that never have any chance of binding to any of the MHC alleles that are present, so there must be a more elaborate mechanism for dealing with the excess. 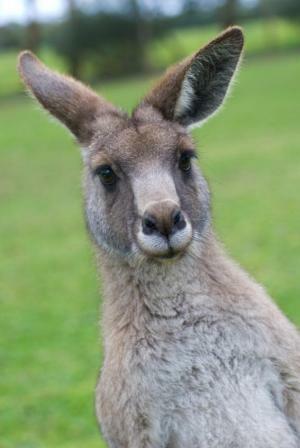 The kangaroo does not know that.